Wallowa County Farmers' Market: The 2011 Season is Under Way! The 2011 Season is Under Way! Despite the cool, wet spring, the 2011 season has been heating up at the Wallowa County Farmers' Market. Additionally, of course, there are flowering plants from The Flower Peddler, Wildflour Bakery goods, Sally B. Farms' rich, handmade goat milk soap, bath and body products from Whispering Pines Bed and Bath, Wallowa Lake Fudge Co. goodies, woodworkers' handcrafts, the ever-popular Kettle Korn, that temptingly fragrant, slightly salty, barely sweet popcorn, and more. 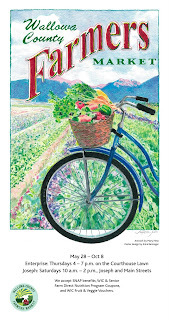 You'll also find a series of demonstrations and presentations from Slow Food Wallowa County (click on the Special Events tab above), kids' activities at the Enterprise Market led by Building Healthy Families and information on the student-tended Magic Garden at Joseph School. It's all at the Farmers' Market.